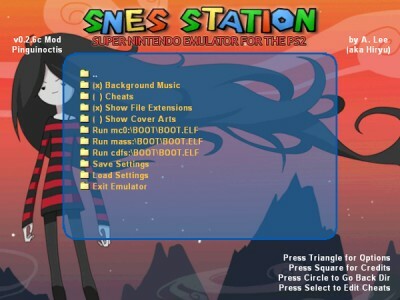 SNES-Station is a Super Nintendo / Super Famicom emulator for the Playstation 2. This MOD made by pinguinoctis is based on Megaman SNES Station extension, since the source code of SNES Station, has never been released. Hiryu, he originally wrote the SNES Station PS2 emulator, and everyone behind it. Megaman, for the SNES Station extension (which this mod is based on). The PCSX2 guys for making a great work with the PCSX2 Debugger in the latest dev versions! Cheat supports, it will use the same cheat files generated by Snes9x. Here is a tutorial: https://pinguinoctis.blogspot.it/2016/10/tutorial-cheats-snes-station-mod-026.html. The possibility to write/load save states from where the game ROM is loaded. they must be copied where the emulator ELF resides and they must be named "BG.JPG" or "BG.PNG" (both lower or uppercase are fine). Added support to PNG images for covers! If no JPG is found a PNG will be searched, this means JPGs will always have the highest priority. For PNG support the uPNG library was used. https://github.com/elanthis/upng. + Fixed the bug which caused ".zip" roms to not appear. The letter "z" was excluded in the comparison function, but the big "Z" still worked. So ".ZIP" roms wouldn't cause the issue. + No more Cheat Mode option. Now to edit cheats it's enough to press the Select button. + Added the possibility to return one directory back by pressing the Circle button. + Added the possibility to have a custom background! Both JPG and PNG images are supported. They must be sized 640x480, they must be copied where the emulator ELF resides and they must be named "BG.JPG" or "BG.PNG" (both lower or uppercase are fine). + Added an option to enable/disable background music in MISC folder. + Added an option to enable/disable black border on covers in MISC folder. + Added some options to run an external BOOT/BOOT.ELF from mc0, mass and cdfs in MISC folder. I don't know how much they are stable, since I had to tweak the loading process a bit. + Added an option to Save (they will be saved in mc0) and Load settings in MISC folder. + Finally I updated all the IRX modules with the latest ones (since I managed to update my PS2SDK). + Added a Cheat Mode in MISC folder, during cheat mode, instead of running a game you can enable/disable single cheats, so now cheat names are important. + Added an option to show file extensions inside MISC folder, it's enabled by default. + Added an option to show cover art in MISC folder! All you have to do is to copy a 128x128 JPG image together with a game and be sure that it has the same name as it. + To avoid confusion between files I restored the file filter as it had to be. + While adding the cover art support I had to fix even HUGE memory bugs in the emulator itself! Memory chunks got corrupted and they were never freed. That is to say, if you ran a game a lot of times SNES Station could crash. Now it should work fine, I hope! + This mod now has dependency only on the fileXio library, so the ELF size is reduced. - Removed the experimental support for video modes, as of now I can't get it right. + Added a MISC folder with options inside (similar to uLaunchELF). + USB modules updated! I didn't realize they were so old, now they are the same as FMCB. + Added *experimental* support to progressive/interlaced video mode inside MISC folder (unfortunately I still can't get it right). + Added an option to enable/disable cheats inside MISC folder. + Added an option to exit the emulator from MISC folder. - Among the suggestions I received, two of them were really simple to implement: enabling/disabling cheats and exiting the emulator from menu. - A better approach would be to display and selectively enable/disable cheats inside a list, but it would require a lot of work and time. Still I'm considering to make it in a near future. - Then, another suggestion was to enable 480p support, I'm still working on it. Screen gets bigger (I don't know if it's correct or wrong behaviour. Maybe it's only my TV fault?) and the image, as expected, becomes a progressive one. + Rewritten ROM selection interface, now it looks similar to the one in uLaunchELF. + IRX modules are loaded only when needed and some of them are updated. + Save States and SRAM Saves now will be written and loaded in the same directory where the ROM starts (except if ROMs are loaded from CD/DVD). So now, for better readibility, save files are filtered out in the ROM selection menu. + Now it works without needing a CD/DVD in the disc tray. + Fixed a bug in the USB rom selection where there was an extra empty space that could hang/crash the emulator if selected. + MC1 now is working in ROM selection menu. + Improved Save States stability.